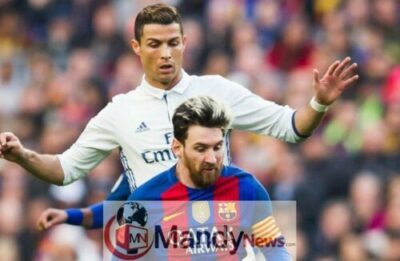 Lionel Messi has paid tribute to his “phenomenal” Real Madrid counterpart Cristiano Ronaldo, saying that he doesn’t get tired of the constant comparisons between the pair. Arguably two of the greatest football players of all time, the Barcelona man and his La Liga rival have shared the past nine Ballon d’Ors between them — and Champions League winner Ronaldo almost certainly will make that a perfect 10 come December. But when asked about his eternal rival during Argentina’s latest stopover in China, Messi said that they are both “armed” by the brilliance of the other, and the rest of the talk around them is just noise. “No, I have always said it — and [Ronaldo] from his part — that he is armed with the presence of us both,” Messi told Tencent. Barcelona relinquished the La Liga title to Ronaldo’s Real Madrid this season, but Messi, who turns 30 later this month, reiterated his desire to stay with the Catalan giants and push for more silverware for many years to come. “Whenever a new season starts it [has] to be better than the last,” Messi said. “We play to achieve more, we play to get more titles, to be in the finals of [the] Champions [League], to win La Liga. Reports surfaced Wednesday that Messi has agreed to a new deal that will tie him to the Nou Camp until 2021. When quizzed about his future and whether he would ever consider a move to China, the Argentine said he intends to finish his career with Barcelona. “Today, I [only] think of my day today, in Barcelona, where I am at,” Messi explained. “To strive to achieve and get the most titles that we can, because in football, we don’t know what could happen in the year to come. So I like to take it calm and little by little. Messi, however, did acknowledge the rising stature of the Chinese Super League — having heard all about it from close friend and Argentina teammate Ezequiel Lavezzi. “We talk a lot of the change [of lifestyle] and football in China,” he said. “A lot of us have commented on the change and how he has been living and what has it been like playing in the Chinese league. Argentina were stopping in China on their way to Australia, where La Albiceleste will take on Brazil in a friendly at the Melbourne Cricket Ground on Friday night.